While checking email over my morning coffee today, I was thrilled to discover that a reader had just posted a 5 star review of my first novel, MAKE THAT DEUX! Like Jenny in MAKE THAT DEUX, sometimes I actually studied! I’m on the right, with 2 girlfriends and the French boyfriend of one! 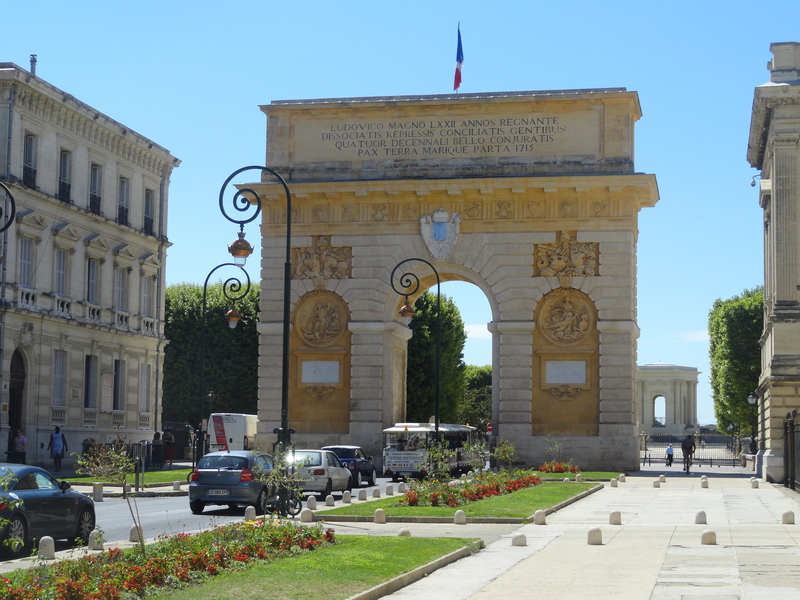 Being in Montpellier with our daughter was wonderful, and it brought back many memories of my time there, when it was a smaller, quieter town. 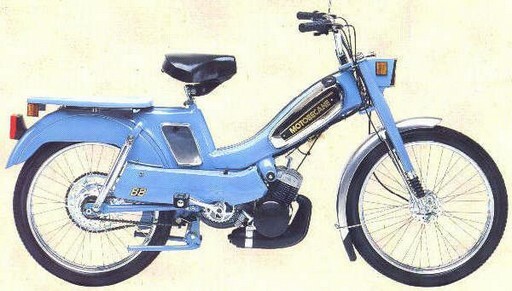 Back then, I motored around on a mobylette (moped) to and from the apartment I shared with two other students in Palavas-les-flots, the closest beach village on the Mediterranean Sea. Mademoiselle lived with a family in Montpellier, and she got around à pied (on foot) and on the (new to me) tram system. Mademoiselle and I have a lot in common, and now we each have our time as a student in Montpellier, too. Something I never imagined, when I first wandered around there and began to love the French. If this gets to you before you leave, consider this your first welcome to Montpellier! I can’t wait to show you and dad around, introduce you to my host mom and our director, and show you all the fantastic cafés we’ve catalogued during our semester here. 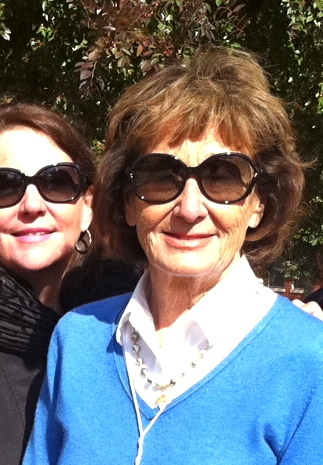 I spent last weekend with the Williamsons* and they were absolutely wonderful – just like you said. I also have a parting gift of confiture du lait which is delicious. See you soon! P.S. They just turned the Christmas lights on and it’s GORGEOUS! *The Williamsons are a French family (despite the anglicized last name) who live in Lyon and have been our friends since their son Charles was a summer exchange student chez nous several years ago. Unlike most other French families, Luc and Juliette have 8 (!) children, who are all teens or adults: Marie, Charles, Doriane, Aline, Lucie, Arthur, Blandine, and Astrid. We spent les fêtes de Noel with them this year, and they made us feel very welcome, and a part of the family! We hope they come visit us sometime soon! A new world of adventure and romance opened up to me during my junior year of college when I was an exchange student in the south of France. 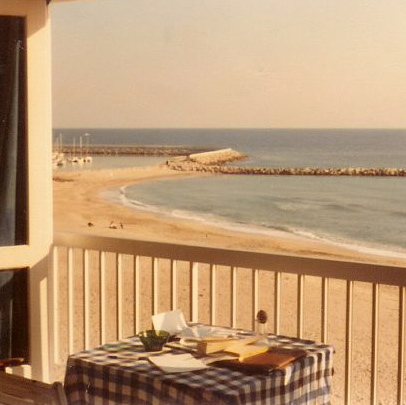 Instead of living with a French family, however, I shared a beach apartment on the Mediterranean Sea with two other American girls, and I left my boyfriend behind in the U.S., unsure of whether our relationship would survive the time apart. The year we shared made a big impact on me, and the three of us have stayed in touch since, even as our lives have taken different turns. When my children began growing up and moving out, I considered my long-held dream to become a writer. I decided to draw on my memories of my experience in France and write a novel set in the time I was there. I felt that Jenny – with her innocence, naiveté and idealism (and that of her two roommates) – could be a fresh character in a literary world sometimes crowded with cynicism. While not everyone would identify with the girls’ belief in “The One,” many would relate to Jenny’s feelings dealing with a long-distance relationship, especially when other appealing men enter her life. …love is possible and important, and that it’s okay not to want to “do life” alone, and to want to go through life with – and to love – another. I got lots of feedback on different drafts of the story from my Writers Critique Group, several beta-readers, and some interested literary agents. I took all their advice to heart and revised the novel many, many times. I connected with one of the readers, who turned out to be the most helpful, through the friend of a friend. Before I finished the novel, though, I took a break from writing/revising because one of my sons, age 19, was diagnosed with a brain tumor in May 2010. He had two surgeries and 5 weeks of radiation therapy and was able to go back to college as a sophomore that fall. His second surgery was performed at Duke University Hospital by the renowned neurosurgeon Dr. Allan H. Friedman. My son faced his illness with courage, strength and hope, and cheered me on in my writing. 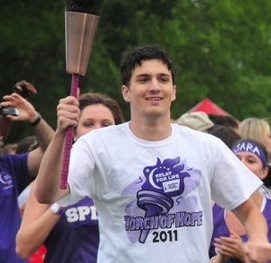 He is now cancer-free and involved with raising funds for cancer research at his university, and he will graduate later this year. Just before I published MAKE THAT DEUX, I traveled to France to celebrate a milestone anniversary with my husband. 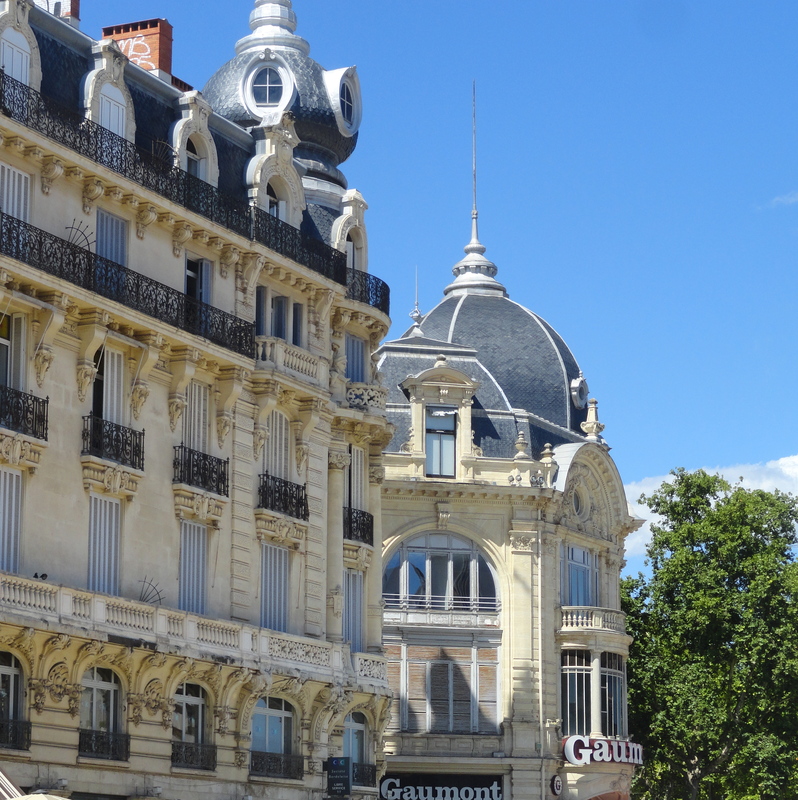 We did a tour of the south of France, visiting Montpellier and Palavas, where I had studied and lived, as well as other lovely spots, then spent several days in Paris. I was thrilled to go back to visit the place where I had spent my year in France and to show it to him. 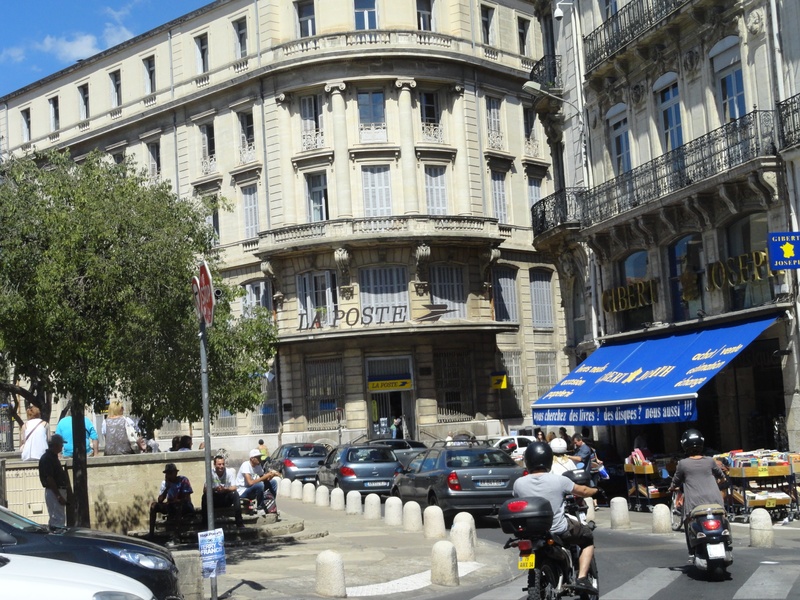 I knew my way around Montpellier, the city in the south of France where I studied for a year, and I knew how to get to the closest village, Palavas-les-flots, where I lived in an apartment on the beach. 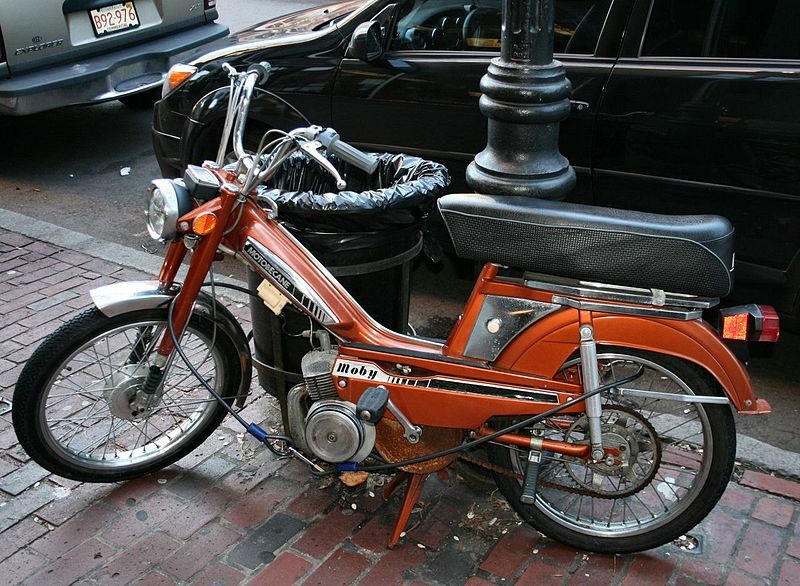 My “bike” didn’t go over about forty miles an hour, but it only took about twenty minutes to get to school. In town, getting around through the narrow, winding streets was easy. When I wanted to call “the States,” I drove to the International Calling Center in the Post Office and waited for a booth. We pulled up to the entrance and opened our car doors with difficulty — the voiture in the photo is much smaller than the one we rented. We unloaded our valises and were politely instructed to park in an underground parking garage about a quarter mile away. Le Guilhelm was a former 17th century coach inn and conveniently located just steps away from wonderful restaurants and cafés. The next day, we tooled around the city, visiting the university I had attended and the village where I lived. I thought I’d be able to figure out how to get to both, using our quirky built-in GPS and drawing on memories over three decades old…since I’ve always been good at directions. We chose la mauvaise route – the wrong way – many times. Without meaning to, we saw more of the city and its environs en voiture than I ever had en mobylette. Guessing at each turn, we made sure not to enter streets with the red and white interdit sign (“do not enter” or more literally, “forbidden”) and finally found a road I recognized (faintly) called Route de Mende. When we found the university, I was struck by how different it was from what I remembered. It was older, of course, and had changed quite a bit. Following signs out of the city, we made it to Palavas using the road I had traveled many times; it seemed much wider. We had lunch at a café on the beach, close to the apartment I shared with two other American girls. 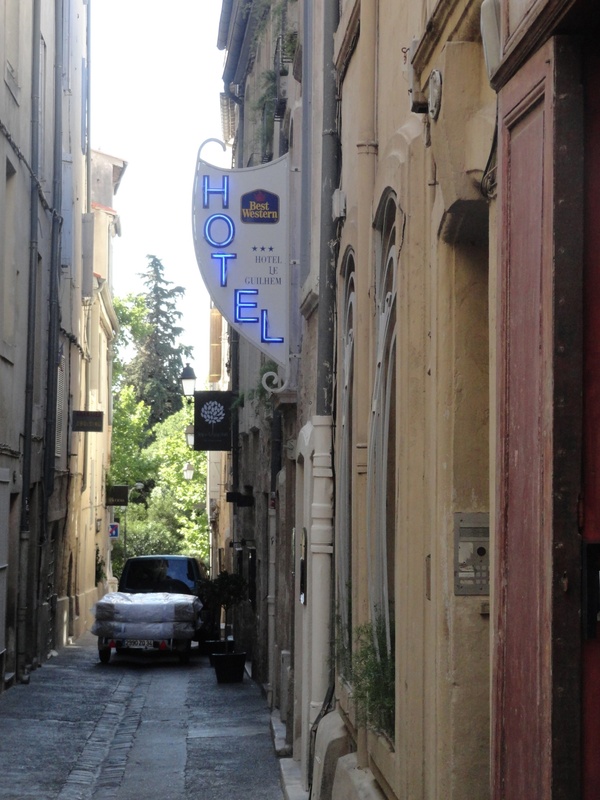 Later that afternoon we returned to Montpellier, parked our car in the garage and set out to explore the centre ville, à pied – on foot. Much that we saw was just as I remembered. The following morning, it was time to drop off our car. We were taking a train to Lyon, and fortunately the car rental drop lot was located at la gare – the train station – not far from our hotel. I had driven to la gare, or by it, through town on my mobylette many times, but by car, it was necessary to take a roundabout route. We gave ourselves an hour to get there. Which turned out to be a smart decision. We had decent directions, but, malheureusement, when we approached la gare, we couldn’t find the entrance. We circled around and around the station, always keeping it in view but never able to approach it. Finally, I asked a Frenchwoman for help, and her instructions (given en français) provided our solution. Comme toujours: Montpellier, en mobylette ou à pied, ça va, mais en voiture, c’est impossible!